Since the inception of Maintenance of Certification (MOC®) by the American Board of Internal Medicine (ABIM) tied to our initial board certification credential in 1990, the costs of "maintaining" initial certification through "continuous certification" have steadily climbed by way of the threat of invalidating our initial certification credential. Nothing is different with the new "Continuous Maintenance Pathway" proposed 15 Mar 2019 by the American College of Cardiology (ACC). In fact, the monetary demands are an order of magnitude greater for working heart specialists and cloaked in smooth propaganda published in the Journal of the American College of Cardiology. To compare apples to apples, it is important to compare 10-year out-of-pocket costs required from physicians participating in MOC®. By way of background, the cost for "Maintenance of Certification" from the ABIM in 2000 was $795 every 10 years. If you are an ACC member, you get to pay even more to the ACC, despite what their website says. 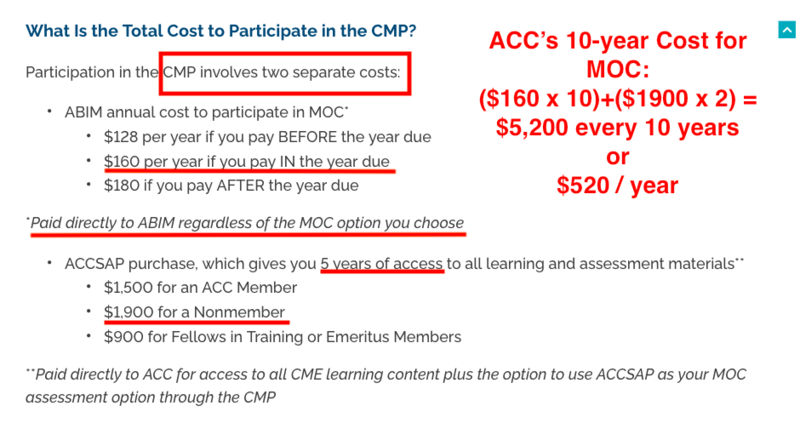 In summary, the ACC's new Continuous Maintenance Pathway is one of the most shameful money grabs from US cardiologists and cardiac electrophysiologists imaginable and represents a remarkable 654% increase in fee payments for MOC® since 2000 for non-ACC members and an incredible $766% increase in fees for ACC members for MOC® since 2000. More importantly, the ACC leverages (ties) CMP to the threat to a physician's ABIM board certification status (and therefore their right to work) and I believe represents a restriction of trade and is in violation of US anti-trust and racketeering laws. It is truly unbelievable that the ACC and the Heart Rhythm Society would do this to their own membership, but then again, given their prolific financial balance sheets, maybe it's not so unbelievable after all. PS: Please help support the federal antitrust class action lawsuit against the American Board of Internal Medicine by contributing here. The astronomical cost of MOC along with its injurious consequences are a result of the monetization and politicization of the ABMS, ABIM and all the other medical specialty boards. Would you like Status Status,Tax & History Information"
MOC is imo unquestionably an illegal restraint of trade tied to certification. The executives are involved in unjust enrichment and the racketeering they are involved in is sickening. Everyone should take note and learn about what is happening to healthcare and the profession of medicine. Especially the DOJ. They should investigate and correct this corrupt metastatic disease. The IRS and the Senate Judiciary committee should conduct and investigation before it is too late. Physicians painfully know what is happening to them and their patients, but congress and the American taxpayer should be made aware of just how advanced this sophisticated bureaucratic cancer has grown. What's taking the DOJ and IRS so long to act? What is preventing the media from investigating thoroughly and reporting to the public. So much corruption of the healthcare educational system is connected to MOC. A thorough study is needed and decisive action taken to fix it and send a strong message to those who violate the public good in the name of public safety/public welfare. MOC is a for-profit enterprise with other corporate for-profit (and political) enterprises connected to it. One wonders why the taxpayer allows such graft in healthcare's (non-profit quality assurance trade associations. It is a puzzle to many who have their eyes wide open, why they are not required to file with the Securities and Exchange Commission as ancillary units/divisions of the corporate bodies/stakeholders that benefit. Obscenely compensated executives of the ABMS and the couple dozen medical specialty boards keep the whole Ponzi scheme running. MOC is a business. A money grab, if you will. It is not education. MOC is coded in ABMS/ABIM medical specialty boards' tax filings as "other". If it is not education, then what is MOC? It is an unnessacary burdensome and unproven metric that is an add on product. It is illegally tied to certification. It is coercion and restraint of trade forced on physicians. The truth is the ABMS colludes with insurers and hospitals to make sure they all maintain control of the power and the money. The ACGME is involved as a key partner along with the NCQA in the "conspiracy". The history of the ABMS with all its self-appointments and placement of their own people in various corporate entities like the NCQA, which has power/influence over hospitals and insurance companies. Or should we say that they have control of the NCQA along with their fortune 500 partners? Who started the NCQA and why? The ABIM and associated testing cartels -- with security/surveillance/data divisions -- are menacing behemoths. The Pearson ABIM/ABMS business relationship is dangerous and now we see WoltersKluwer getting commerically involved with testing/medical knowledge with KCI. I find it hard to believe that medical specialty boards are allowed as non-profit organizations to act with such impunity regarding the unrestricted business activities and payouts to themselves. Stop being members of the ACC and all specialty colleges! perpetrated and continued by elitists academic doctors, the deans of medical schools, professors, the ones that are supposed to lead by example and educate tomorrows physicians. they are all scum who put therir professional interests over ethics. i cancelled my FACP and FACC. let these colleges who support ABIM and ABMS go broke.